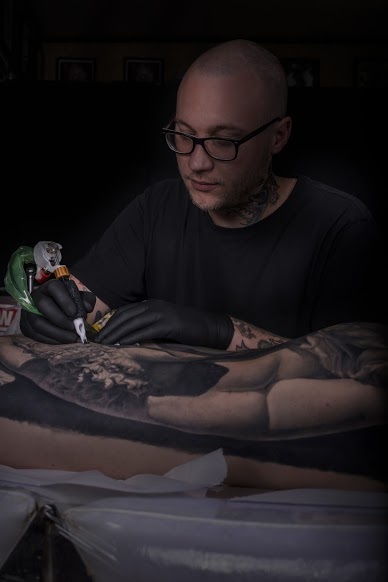 Interview: Tattoo Artist Ben Kaye – Spotlight Report "The Best Entertainment Website in Oz"
After traveling the world, tattoo artist Ben Kaye has been living in New Zealand for almost 4 years, where he has made a name for himself as one of the country’s top artists, with impressive realistic pieces and complex artworks. Ben is currently in Australia to be part of the Rites of Passage Festival in Sydney, and we had the chance to get in touch with him beforehand in order to find out more about his work and personal experiences during the years. SR. Let’s start from the beginning. How this passion about tattooing started? It all started when I got my first tattoo. It was in a cool little shop in Northern England. Steve, he had such rad stuff on the walls, Harley in the doorway, heavy metal on the tiny TV and he didn’t talk much. I picked something off the wall and left with so many questions it just set off a spark and it hasn’t left me since. SR. Despite living in modern times, there is still a bit of “taboo” about this form of art, especially among the most conservative parts of society. Eg. Having tattoos might play against you while trying to get a job. What’s your take on that? It’s a hard idea for me, I live in a world of heavy tattooed people all successful at what they do. I think this question is really about job stoppers (face, neck, head, hand tats) if someone has a lower back dolphin tattoo why would a boss or employer see that?! Saying that I understand an old lady that has a different view on tattooed ppl, maybe finds tattoos intimidating walking into a bank and not really wanting to be serviced by a dude with lots of face tattoos. Also that a business owner’s wants to be represented by people like them. It’s easy to be like “ooh that’s bad people should be able to do whatever we want and get whatever we want tattooed” but its not the world we live in. people judge you on everything. if you want to be a lawyer don’t get a savage skull on your neck. Every piece has its own challenges but I find portraits the most challenging. 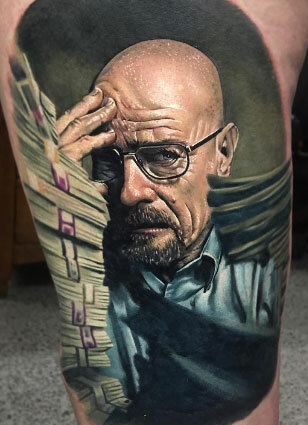 Portraits are very easy to get wrong and when it’s such an iconic character like the Walter White it adds a lot of pressure and can be stressful as hell. 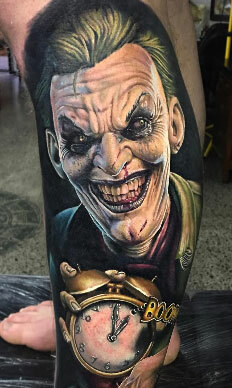 Realism is my favourite to tattoo, it covers everything and has no limits to design or ideas. It’s a style that can be mixed and mashed with others and is so flexible, it’s exciting to work with. My favourite style to get tattooed is Traditional. I’m not good at it so good trad artists blow my mind. 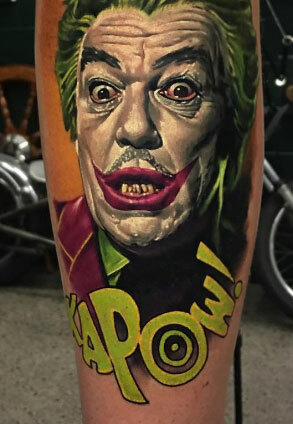 SR. Our director, is a crazy Joker fan, and is obsessed with the Joker’s you have done, from the Cesar Romero to that big one with Harley Quinn Is there is any Joker Tattoo you haven’t done yet and you would like to do, or maybe any film or comic character? 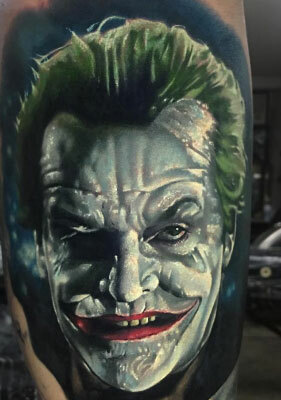 Haha I’m the joker guy aye, I don’t know how I’ve done so many. I still have a few I’d like to do there’s some great cosplay guys out there that release photography based on famous comic covers. They’re Rad. I’m a bit of a geek so anything from video games or comics gets my blood boiling. SR. Have you ever been in a situation where a tattoo has gone horrible wrong? SR. What’s the worst tattoo you have ever had to cover up? I’ve covered up some bad stuff, The worst was probably a double cover up. The client had a small old tattoo, then had that covered up with a bad realistic rose and then I covered that up. Now a days I suggest laser to lighten old tattoos up, which gives the client and me a lot more options. SR. What’s the worst spot you have ever had to tattoo? What did you do? There’s good and bad spots on the body. It’s more about the piece, a cool piece in a bad spot is still a lot of fun to tattoo. Saying that straight lines or circles on the ribs give me nightmares. SR. Obviously, you have had some clients from hell. Which one has been the worst so far? Most of clients now are pretty good and maybe I’m a little bit nicer :) but in the early years I had people break down and cry, bite pillows and there own hands. I think the worst are the people that super underestimate what getting a tattoo is like. I had a guy when i first moved to NZ, His first tattoo huge Rib piece, outline of the New Zealand map with different native birds etc inside. He quit halfway through getting the outline and never came back to this day I’m sure he’s walking around with just the north island and the top coast line of the south island. SR. Have you ever refused to tattoo something? Can you give us some samples or things you will never tattoo on somebody? I won’t tattoo anything offensive. Its’ rare I get asked for that kinda thing. The one tattoo I refused that really pops in my mind was on a girl that came in with her boyfriend. He was bullying her to get his name tattooed on her wrist. It was insanely clear she didn’t want it so I told him I don’t brand people for a living. SR. What’s your take on TV shows like Ink Master and Tattoo Nightmares? I don’t watch them to be honest but I do think anything that educates people about good tattooing and good tattoos can’t be a bad thing. SR. Have you ever inked a celebrity? Who? What did you tattooed? No… If but if Jim Jefferies is reading this, I got you brah! SR. For all your fans there. Do you have any spots available for people to go and get inked at Rites of Passage? METHOD – The comedy about two actors doing anything but acting!